Activity variations: You can change it from an established fast food chain to a new market entrant, to determine an appropriate entry strategy. Additional resources: For more information, please review ‘Benefits of Market Segmentation‘. The main purpose of segmenting any market is to identify different consumer needs in order to construct an appropriate marketing mix. 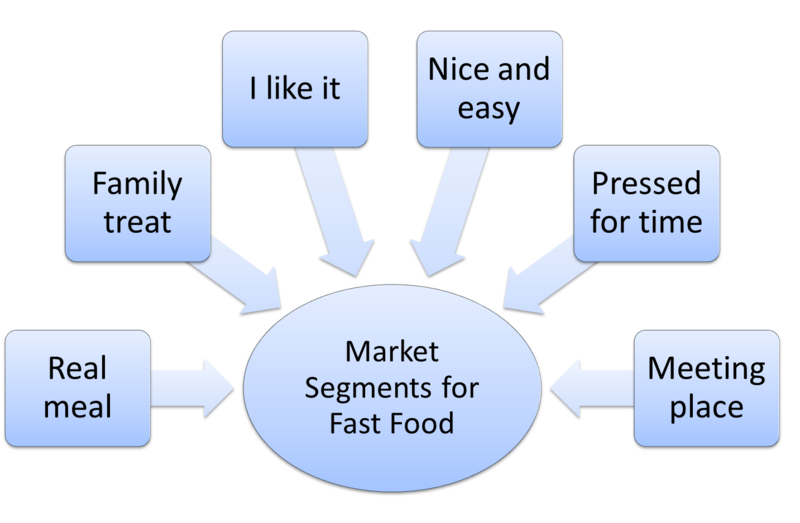 For this activity, let’s assume that six different market segments have benefit identified in the fast food market, as highlighted in this diagram. The first market segment essentially looks at fast food as a “reward” for good behavior or as a special treat for the family. This consumer segment will consume fast food primarily for the taste of it – that is, they simply enjoy it. This consumer group views fast food as an easy option for food. These consumers are not overly attracted to fast food, but are not always in the mood to cook. This market segment is quite time-poor. Their preference is NOT to consume fast food, but it may be a necessity for them at times. This segment of consumers is seeking the convenience benefits of fast food, but they are looking for a relatively healthy food option as well. The final market segment in this example is not interested in the food to much extent, instead they are attracted by the location and facilities of the fast food outlet and use the venue as a meeting place. Review the above market segments. Which ones do you think would be the more attractive segments for a fast food chain (that is, the better target markets)? Having selected your preferred target markets in Question One, outline how a fast food chain could configure its marketing mix to meet the needs of these consumer groups. 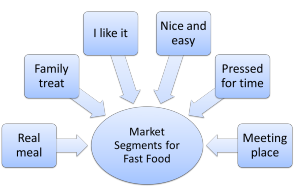 Would it be possible for a fast food chain to structure their marketing mix in such a way that they could meet the needs of ALL six market segments? If yes, how could they do this? Do you know of any fast food chains that appear to target ONE market segment only?